In this chapter we shall describe what should alert us to suspect aluminium toxicity and the useful tools we gather today to confirm this diagnosis. As the first step is to suspect aluminium toxicity, our attention should be drawn to investigate mainly the role of dialysis fluids and oral aluminium intake. 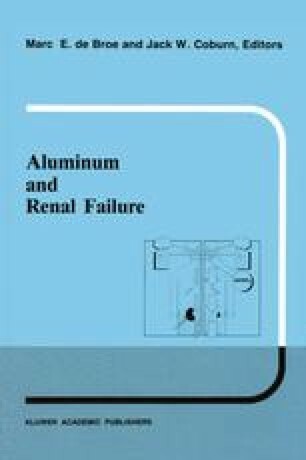 As a general rule, a long-term management of renal patients should be always suspicious of long-term aluminium exposure. Although till recently, nephrologists assessed aluminium toxicity only in symptomatic patients, a great percentage of renal patients could have alumi-nium accumulation without clear cut symptoms and therefore the present trend is to perform a more ample screening. The current clinical findings useful to suspect aluminium toxicity are the presence of bone disease, central nervous system disorders and worsening of the anaemia, nevertheless, all these manifestations can be considered late indicators of aluminium accumulation. The non-invasive methods play an important role in the suspicion and also in the diagnosis of aluminium toxicity. The presence of hypercalcaemia together with inadequately low parathyroid hormone levels must be carefully evaluated as they constitute a very frequent pattern of aluminium toxicity. The radiological findings and the different types of bone scans can be also valuable and complementary studies, but never by themselves can confirm the diagnosis. Serum aluminium levels are indeed higher in patients with proved alumi-nium toxicity. However, they have a limited value in the diagnosis of alumi-nium accumulation, being particularly useful as an index of acute aluminium exposure. In addition, baseline serum aluminium levels frequently correlate with bone aluminium but they are not a reliable predictor of aluminium-induced bone disease. The desferrioxamine test has also some limitations, however, it could give a more accurate information about aluminium body stores and it has a particular value in excluding the diagnosis of aluminium related bone disease. In the diagnosis of aluminium toxicity none of the clinical and biological features described previously are neither specific nor essential. In fact, a conclusive proof of aluminium toxicity in human would require the demon-stration of aluminium accumulation in a given organ. To date, of the three target systems described as affected in aluminium toxicity, only bone is available and fulfill enough criteria to make a diagnosis. As stainable bone aluminium correlates with aluminium bone content and because its localisation at the osteoid/calcified bone interface has a great value in predicting bone histology, it is always necessary to perform histochemical staining and histomorphometrical studies of bone biopsy specimens to make a more precise diagnosis of aluminium-induced bone disease.